Το Safran, ένα από τα πιο πρωτοποριακά open 60, για μια ακόμα φορά πρωτοτυπεί με τα νέα του συστήματα, νέο σύστημα για το water ballast, νέα καρίνα τιτανίου και νέο πρωτοποριακό άλμπουρο με 3D woven carbon track το οποίο είναι κάτι εντελώς νέο στον κόσμο των ωκεάνιων αγώνων. Με τις εξειδικευμένες γνώσεις του γκρουπ της Safran στην αεροδιαστημική, σε συνδυασμό με τους ειδικούς στην ιστιοπλοία έχουν προχωρήσει την έρευνα και την κατασκευή των απαραίτητων υλικών σε πολύ υψηλό επίπεδο και πλέον τα εφαρμόζουν και στην θάλασσα. Η μείωση του βάρους και η αύξηση των επιδόσεων που αυτό συνεπάγεται είναι τεράστια και σε συνδυασμό με την αύξηση της αξιοπιστίας φαίνεται πως έχουν βρει την ιδανική λύση. Για το νέο άλμπουρο μας λέει περισσότερα ο Guillaume Verdier, που είναι ο σχεδιαστής και ο υπεύθυνος παραγωγής του νέου 28μετρου άλμπουρου (στα Αγγλικά). "This new mast is the result of a lot of different people working together. The real innovation is on its rear side, with a 3D woven carbon track, formed in the same way as Jacquard cloth is produced and which will withstand the strains, unlike a traditional track," summed up the designer. "We didn’t begin with a blank sheet of paper, as the initial choice was to keep the basic arrangement of the first two masts, in other words, it rests on the deck and has three layers of spreaders. 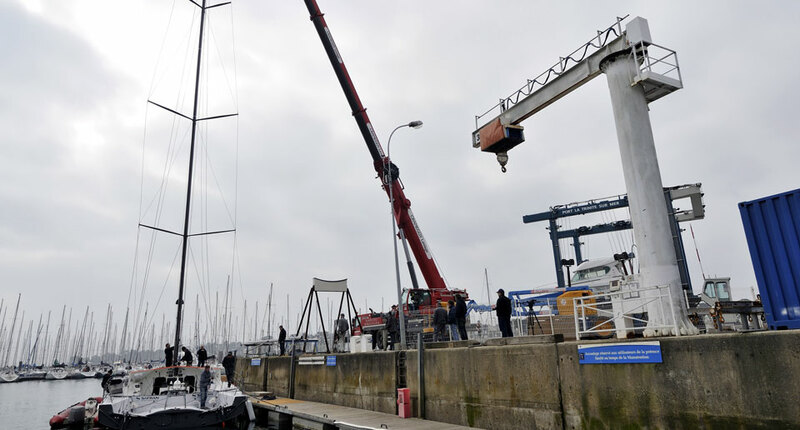 We didn’t want to take any risks by completely changing the concept, with for example a mast with two layers of spreaders or a wing-mast, which are both more flexible and subject to dynamic forces. We gradually made headway working together: I was involved with the conception and design, Hervé Devaux at HDS checked over my static calculations, Bruno Dambrine at Safran offered us his experience of the 3D woven technology and then, there was also Snecma and Safran Engineering Services (subsidiaries of the Safran Group) working on dynamic calculations. 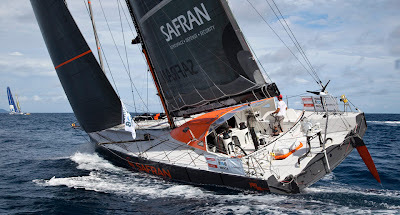 Thanks to digital modelling and the means available at Safran, we were able to carry out simulations at each stage of the job concerning the behaviour of the boat and mast, for example, seeing what happens, when she slams into a wave. Thanks to that, we were able to identify strains in certain places that we couldn’t see simply by using static calculations." These dynamic calculations, used by Safran in particular for their crash tests, are a new concept in ocean racing, and enabled the team to advance towards this highly innovative mast. 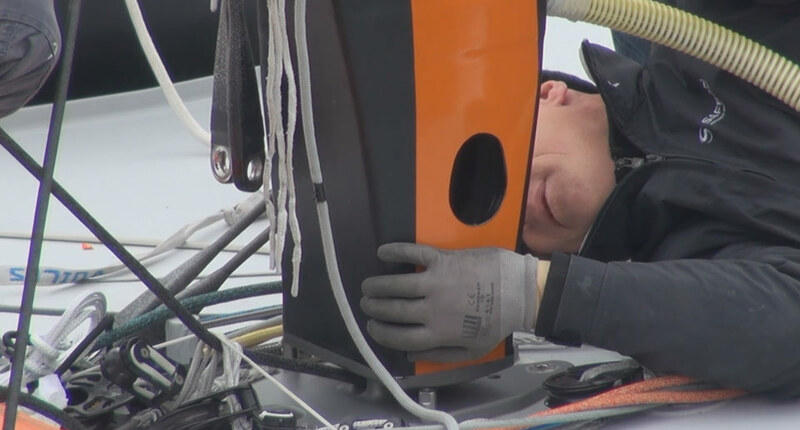 "We also included the data we already had thanks to the sensors measuring acceleration on board the boat, when she had her previous masts. At each stage, we knew if we were on the right track or if we had things to correct." The actual weight savings are obviously confidential. 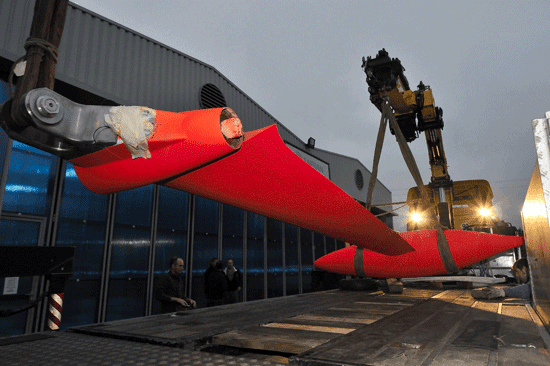 But they are “huge”, according to Jean-Marie de la Porte, Safran’s project manager. 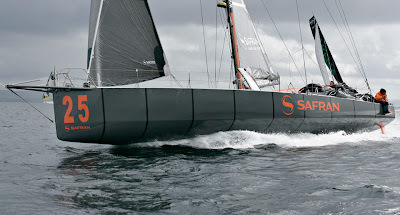 If we are looking at a boat, we need to consider everything, and it is no surprise to anyone that saving weight high up, is something everyone looks for, "as when you save one unit on top, you can take three times that from the keel bulb, for example," explained Guillaume Verdier. We end up with a boat that is stiffer, which cuts through the waves more easily, which pitches less, and so is faster. Returning to the 3D woven technology, this is a process developed in the Safran Group, which involves weaving together carbon threads using the same principle as on a traditional loom. This technology used in the design of parts for the aircraft industry means that it is possible to obtain mechanical specifications, which are much higher than using traditional carbon. As for the final result, we leave that to Marc Guillemot to explain. 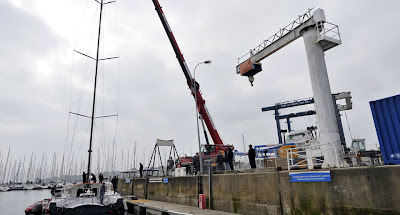 What did he see at the recent Guyader Grand Prix, which was the first opportunity to try out the mast in a race? Out on the water? The reply is clear: “What I felt since the trails has been confirmed: we’ve made considerable progress. We see that in every point of sail, particularly sailing upwind. Last year, as you might expect, we were lagging behind the boats from Safran’s generation, which were built afterwards (PRB, Macif, Banque Populaire, etc), but now we’re back up with them. Combined with the new ballast system and the new keel, this work we have done together is rather like pushing the reset button. For the moment, it’s very encouraging."